This burger definitely falls under the healthy category – a must for BBQs this summer if you’re counting calories. The recipe came from one of the swaps I participate in, and I have to say, I was a little skeptical about it at first. I knew that the zucchini would give the turkey meat an even softer texture than it already had…combine that with the fact that there was no bread, and I got nervous. Then, I formed the burgers and really got worried. They were super soft…so soft that I was afraid they’d break while on the grill. Mix ingredients and form into patties. DO NOT overhandle meat, as it will already be delicate. Cook on grill over high heat. This entry was posted in burgers, main dishes, QuickAndEasy, sandwiches, turkey, zucchini. Bookmark the permalink. These burgers were amazing. And guilt free to have seconds! What a great idea. I would have been nervous, too. I’m going to have to give this a try. Once late summer rolls around I’m always looking for uses for zucchini. 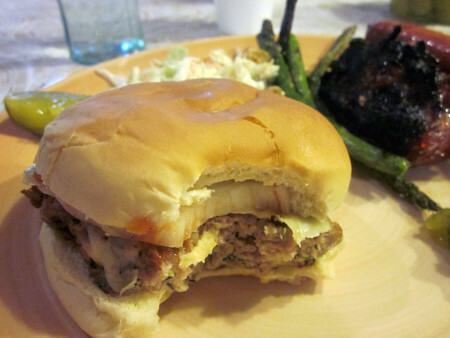 I’m not usually a turkey burger fan…but these were sooo delicious. Love your blog! Can’t wait to try these! I love the idea of using veggies to bulk up a burger in a healthy way. I have seen mushrooms used but never zucchinis, yum!